Here's an easy tip to make it easier when you start to learn guitar and help you develop better technique. 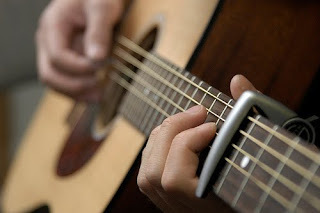 Beginner guitar learners often have trouble with the finger stretches required to make some chord or scale shapes across the frets of the guitar. Invariably you first learn to play chords and scales in open positions near the head of the guitar neck. But the spacing of the first four frets is the widest on the guitar's neck, forcing you to stretch your fingers uncomfortably. What few beginners are told is that you can learn these exact same chord and scale shapes with smaller fret distances to stretch over. To do this all you need to do is place a capo across the strings and play higher up the neck where the frets are narrower. Somewhere between the seventh and the ninth frets is a good place to start. Here you have narrower frets to work with without being too cramped up against the guitar's body. In this position you'll be less inclined to adopt incorrect postures to force your fingers to reach notes beyond their current stretch. Your technique will benefit from this as you learn more optimal postures to finger chords and scales. As you progress you can move the capo down the neck one or two frets at a time. Your fingers will gradually develop the stretch needed to reach across wider frets. That was a very good tip that a DIY beginner might not have considered. As a musician and guitar teacher who's NOT a capo snob, I consider the capo to be a wonderful tool. Sometimes it's hard for experienced musicians to consider the little things they take for granted that beginners just aren't privy to if they haven't taken lessons. Keep up the good work! Cheers! @Magnolia lessons and repairs - I know what you mean. Didn't take many lessons myself and I'm always amazed by things I discover that aren't taught in books or discussed anywhere. I think that is a terrible tip for beginners. Any beginner who does this will never learn the correct open chord positions and will lead to even more frustration and an inability to play at the lower frets. Hi James, Thanks for your comment. I don't agree that it will lead to frustration and never learning correct open chord positions at the lower frets. As stated in the post the goal is not to play this way forever, but to move the capo down a fret or two at a time to reach those lower frets. This approach offers stepping stones to make the journey easier for those having a hard time getting started.